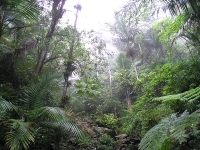 The Caribbean National Forest, 35 miles (56km) east of San Juan, is the only tropical rainforest in the United States National Park system and was named El Yunque by the Spanish. Its 28,000 acres contain about 240 different species of tree and numerous other plants, from tiny, delicate wild orchids to gigantic ferns. Visitors can start their visit at the El Portal Tropical Forest Centre where there are films, exhibits, and interactive displays on the rainforest. Maps are available of the dozens of walking trails through the forest, graded according to difficulty. Nearby is Puerto Rico's best beach, Luquillo Beach, famous for its soft white sand and towering coconut palms.